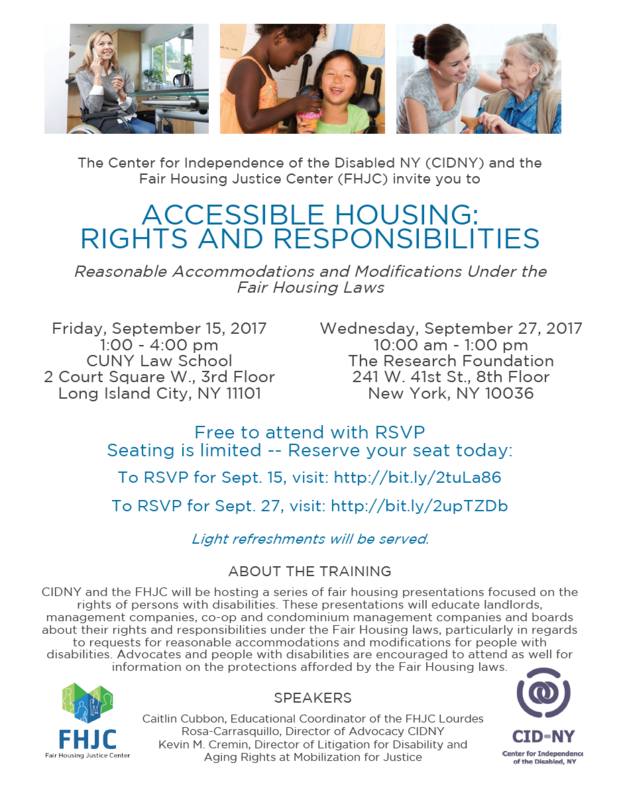 The Fair Housing Justice Center (FHJC) and the Center for Independence of the Disabled, New York (CIDNY) will be hosting a series of free fair housing workshops titled “Accessible Housing: Rights and Responsibilities.” These fair housing workshops will focus on rights and responsibilities under fair housing laws, specifically requests for reasonable accommodations and modifications for people with disabilities. Key speakers at these presentations include Caitlin Cubbon, Educational Coordinator at the FHJC; Lourdes Rosa-Carrasquillo, Director of Advocacy at CIDNY; and Kevin M. Cremin, Director of Litigation for Disability and Aging Rights at Mobilization for Justice . Each three-hour long workshop will be geared towards educating landlords, management companies, co-op and condominium management companies and boards about their rights and responsibilities under fair housing laws. Advocates and people with disabilities are encouraged to attend as well for information on the protections afforded in fair housing laws. There are currently two opportunities to attend one of these workshops. The first is at 1 pm on Friday, September 15, 2017 at CUNY Law School. The second is at 10 am on Wednesday, September 27, 2017 at The Research Foundation. These events are free and open to the public, but RSVPs are encouraged. Reserve you seat now, as space is limited. Light refreshments will be served.